My daughter has always had the gift of musical ability. She has taken piano lessons, and her teachers were always amazed at how quickly she learned, as well as her ability to memorize songs. After playing a song from sheet music a few times, she would know it by heart. She also sings. She has a big voice, reminding me of the little girl from Annie. Her voice has always been that way. We joke that she was loud when I delivered her and is still loud. We are always telling her to keep her voice down. We knew it was a blessing, it was just in disguise for a while! Now she's taking guitar lessons. She's never taken group lessons before. It's fun because they have "jam" sessions. Not that she's met any of the other students. She's in a virtual setting. How cool is that? I'll bet your saying, "How can you learn a musical instrument over the internet?" I was apprehensive at first, too, but my daughter is really learning, and getting pretty good. 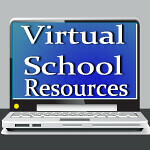 Virtual Schooling can provide so much more than the basic subjects. My oldest completed Spanish 2 last year, and learned much more than she did in a classroom setting in Spanish 1. In fact, because she had a speaking test where she had to record herself for each module, she became more fluent. She never got that much personal attention in the regular classroom. My youngest is taking photography this semester. I'm learning a lot myself, just by looking over her lessons. It almost makes me wish I was in middle school again. Almost.